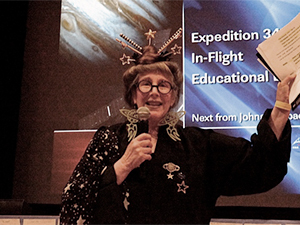 Shelley Bonus, an instructor with UCLA Extension’s Osher Lifelong Learning Institute (OLLI), was recently awarded the 2016 AstronomyOutreach Award for her lifetime of work around the world in public educational outreach in astronomy. Bonus has received numerous other honors in her career – including, but not limited to, the time the International Astronomical Union named an asteroid after her, citing her unique method of translating the most difficult of scientific discoveries to the public. The author of several astronomy texts, including the Solar System Guide for Carl Sagan’s Planetary Society, Bonus wrote the content for Caltech’s Infrared Astronomy website COOLCOSMOS, and continues to write the very popular “Space E! Tracy Planetarium Shows and Lectures.” Bonus is also an archeo-astronomer, linguist, and presentation coach. How wonderful! We think she is exceptional and her class definitely stands as a high point of our Osher experience here. We hope she continues to offer many courses at different times so we can all have the opportunity to continue to learn from her. Enter your email address to follow this blog and receive notifications of new posts from OLLI@UCLA by email.